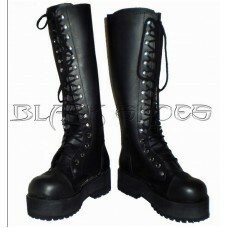 Real leather ankle boot with eyelet and buckle detailsMANUFACTURE BLACK SHOESAVAILABLE IN SIZES ..
Real leather mid-calf boot with eyelet and shoelace. 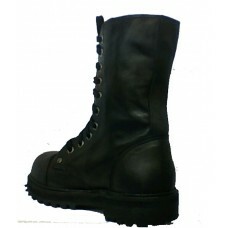 MANUFACTURE BLACK SHOESAVAILABLE IN SIZES..
Real leather ankle boot.MANUFACTURE BLACK SHOESAVAILABLE IN SIZES INTERNAL SHOE SIZE CHART..
Pentagram-shaped PU Backpack with metal half-rings. Size: Height: 23cm/9.2”; Length: 19..
PU bag with zipper fastening. PU strap with chains incl.Size: Height: 29cm/11.6”; Length: 31.. Synthetic Vinyl Bag with corset design with straps (as shoulder-bag)Size: Height: 19cm/7.6”; .. Wet Look Blouse with details Pu and ring, fishnet sleeves.NUFACTURE BLACK SHOESAVAILABLE IN SIZESS -.. Wet lokk Dress with fishnet details and eyelets.MANUFACTURE BLACK SHOESAVAILABLE IN SIZESS - .. Wet Look Dress with details ring, PU and eyelets.MANUFACTURE BLACK SHOESAVAILABLE IN SIZESS - M – L..
Peplum velvet dress with sleeves.MANUFACTURE BLACK SHOESAVAILABLE IN SIZESS - M – L.. 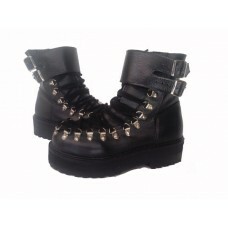 Wet Look Cropped, with details PU and half ring with design inverted pentagram.MANUFACTURE BLACK SHO.. Wet look Catsuit with PU details, eyelets and zipper on the sleeves. He has an invisible zipper beh.. Wet Loo Shrug, with slits at sleeves and PU and eyelet detailsMANUFACTURE BLACK SHOESAVAILABLE IN SI..